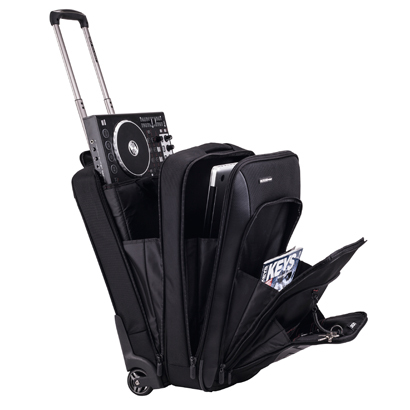 Notebooks up to 15.4" can be safely stored in the sturdy laptop bag and the integrated USB stick compartments and extra removable bag for cables, interfaces, headphones or external hard disks provide additional storage, meaning the trolley can be rolled comfortably to the next gig. The versatile, padded inner bag is also perfect for the Terminal Mix 2 and Jockey 3, making the trolley multi-purpose. Stylish and made of extremely hard-wearing and water-repellent materials, the unit offers smooth-running inline wheels and a full aluminium bar with extricable telescope handle. Without contents the unit weights a mere 4.3kgs and measures 420 x 580 x 220 mm which reaches the regulations for the hand baggage of several big airlines. The Reloop Terminal Mix 4 Trolley is available now priced at approximately £160.